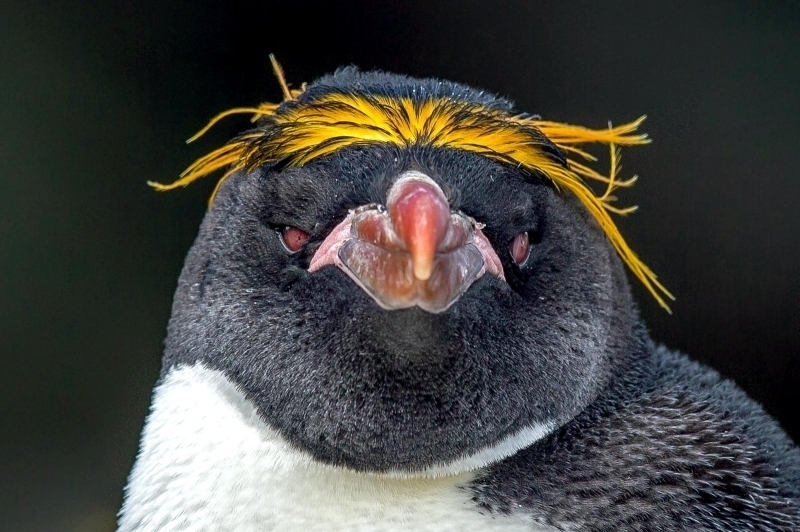 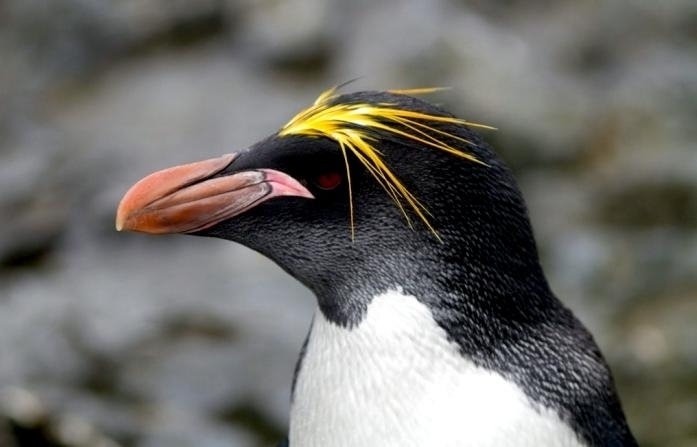 Macaroni Penguins are wonderful rather large, crested penguins with yellow plumes of feathers rising from their foreheads, extending back along the crown of their heads and down behind their eyes. 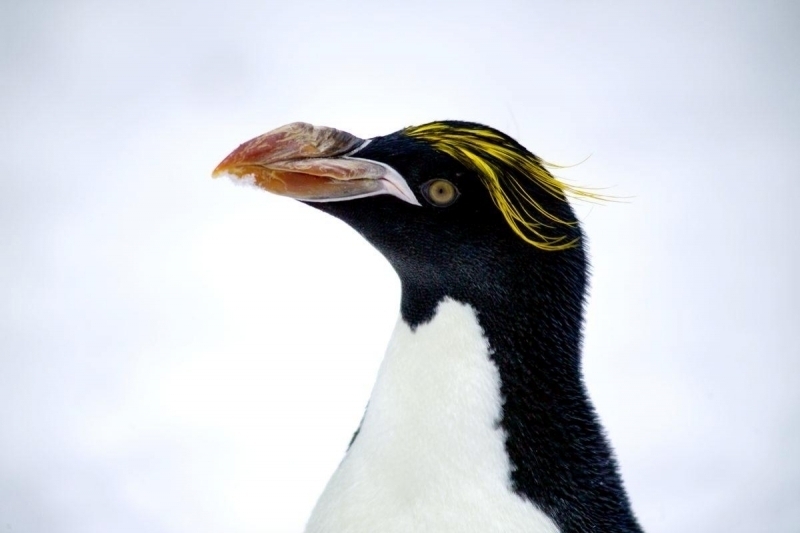 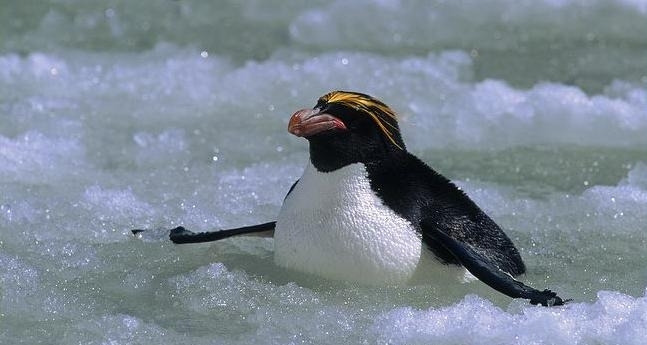 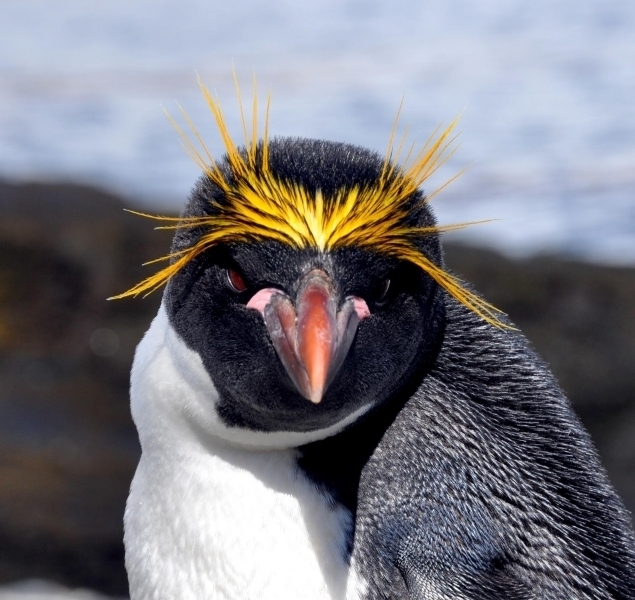 The Macaroni Penguin was named by English explorers. 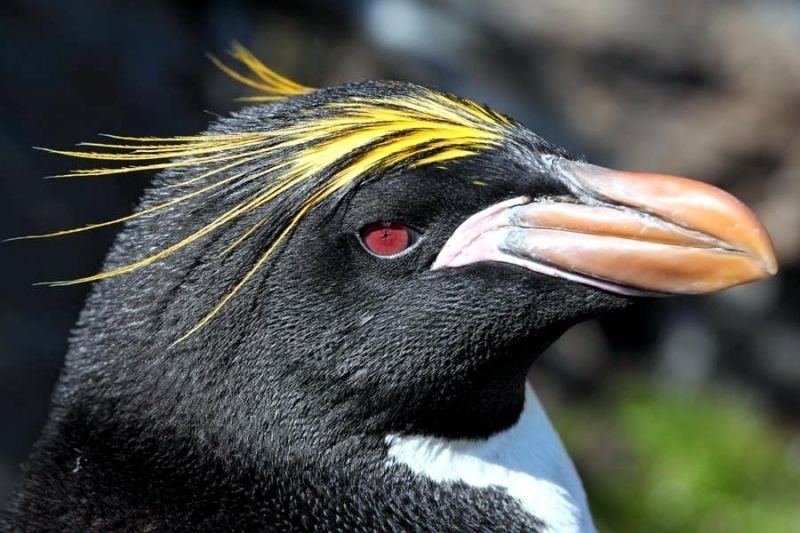 In the mid-18th century, a young man who wore flashy feathers in his hat was called a “Macaroni”. 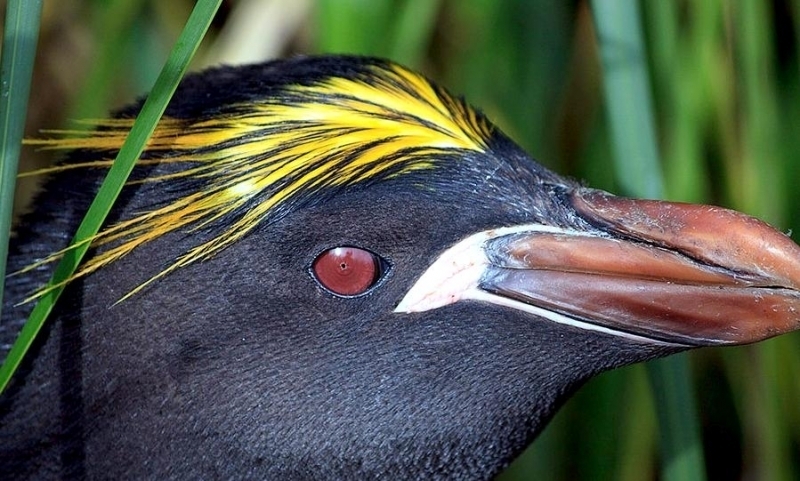 The English explorers thought the yellow-crest feathers of this penguin looked just like the flashy young man. 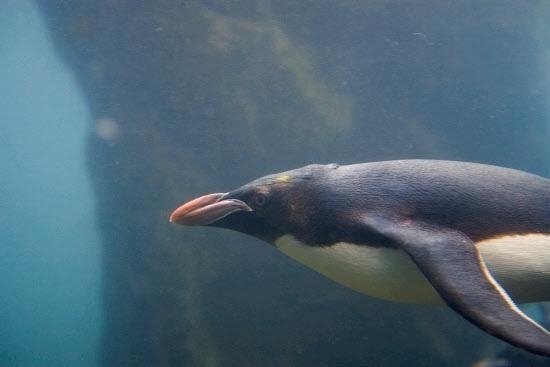 The word Penguin first appears in the 16th century as a synonym for the now extinct Great Auk. 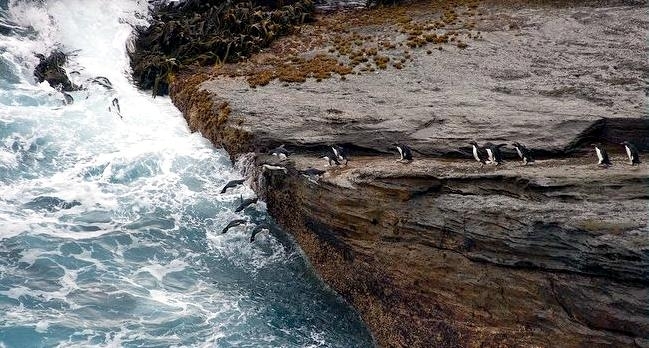 When European explorers discovered what are today known as Penguins in the Southern Hemisphere, they noticed their similar appearance to the Great Auk of the Northern Hemisphere and named them after this bird, although they are not closely related. 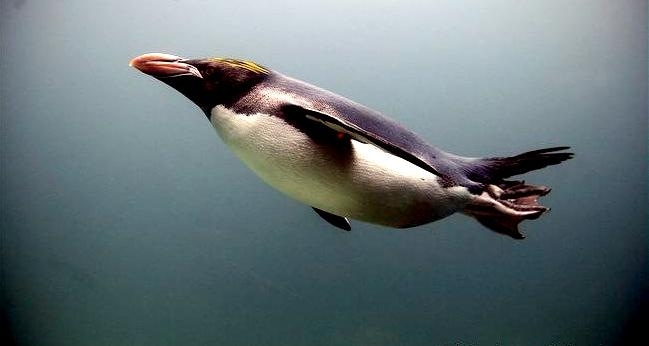 Their backs, heads, chins, throats and chests are black; their bellies are white and their flippers are black on the dorsal (upper) sides and white on the ventral (under) sides. 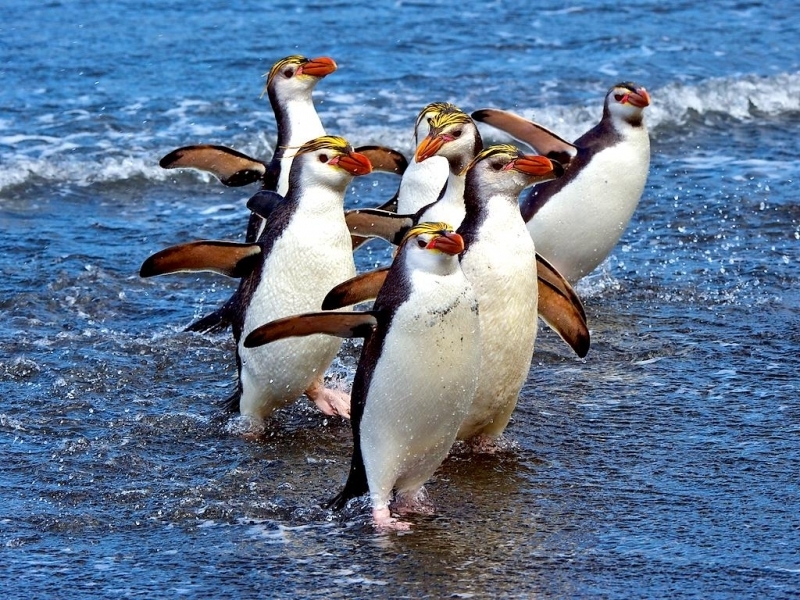 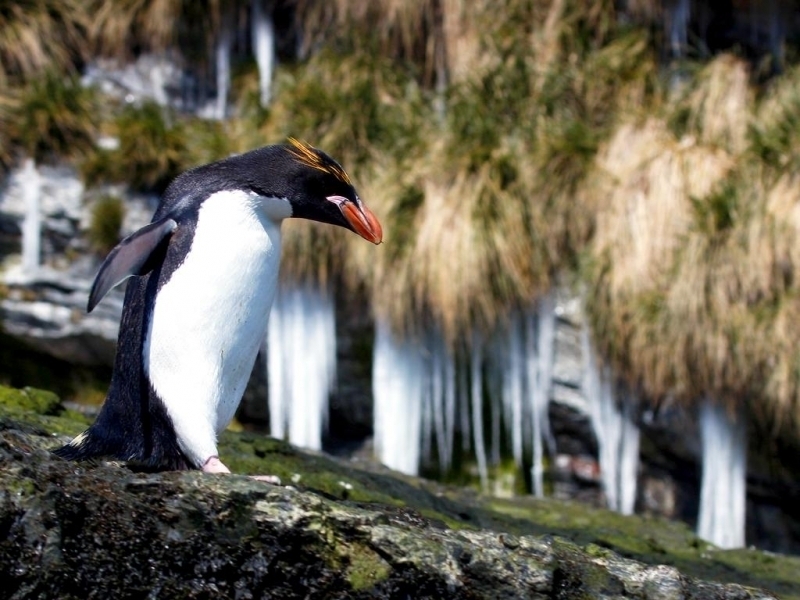 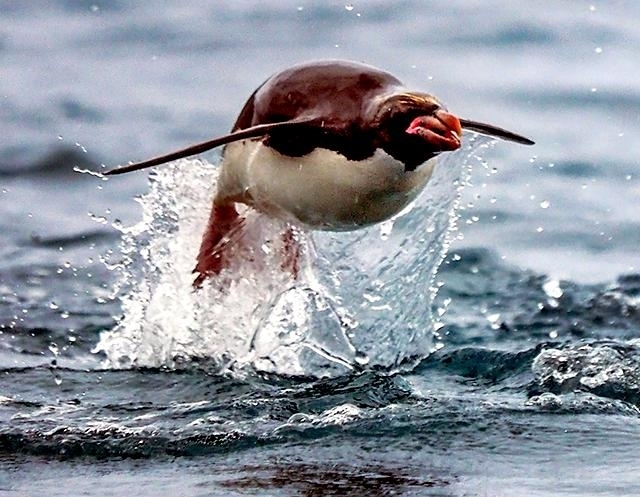 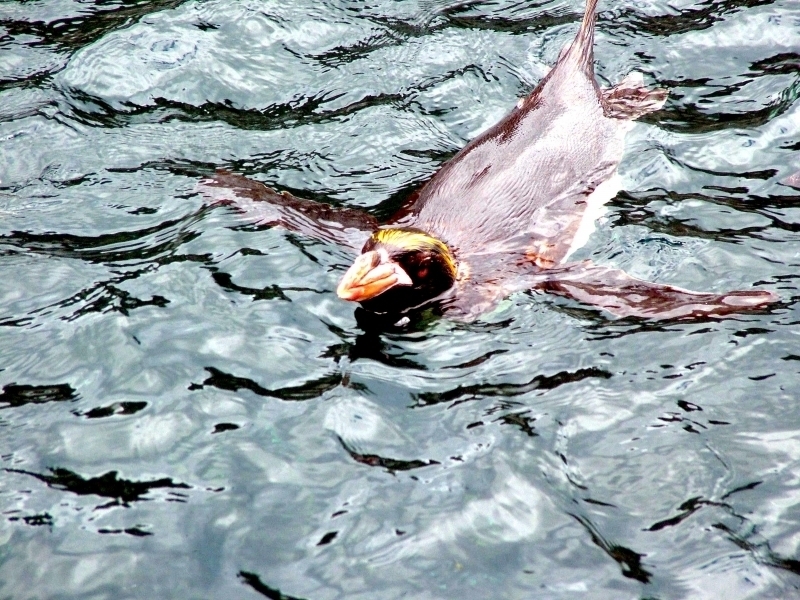 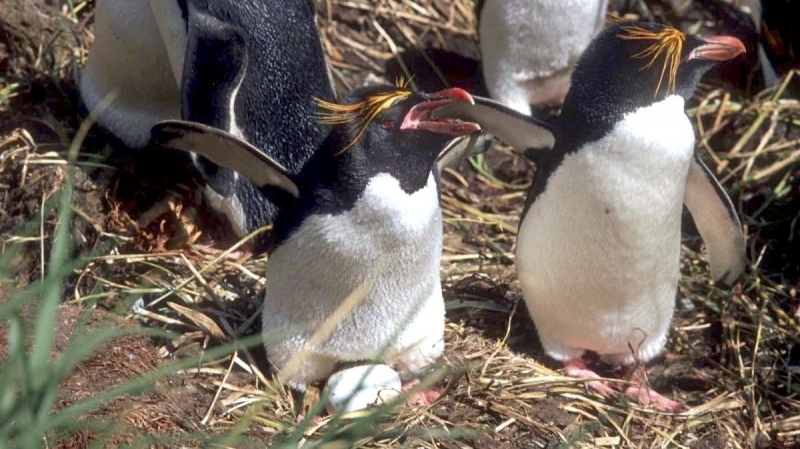 Macaroni Penguins have large orange bills, red eyes and pink feet. 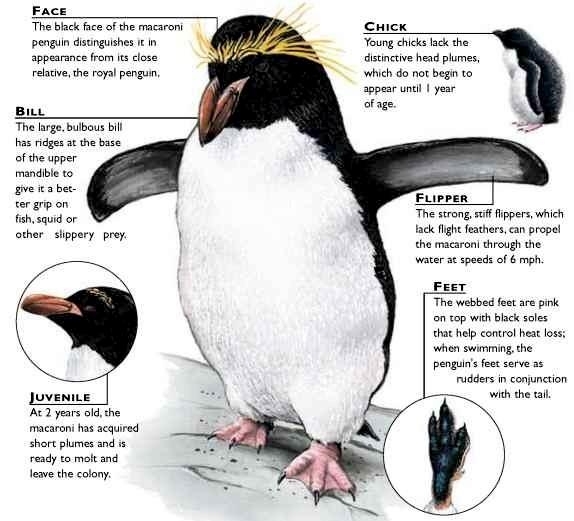 Juveniles do not have the head plumes of adults and their bills are smaller & darker. 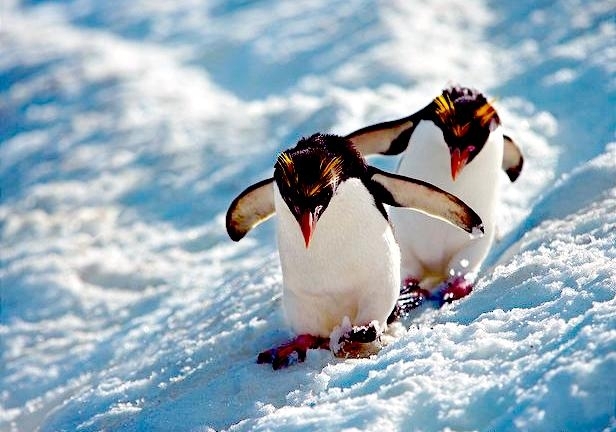 They average about 70 centimeters tall and weigh about 5.5 kilograms. 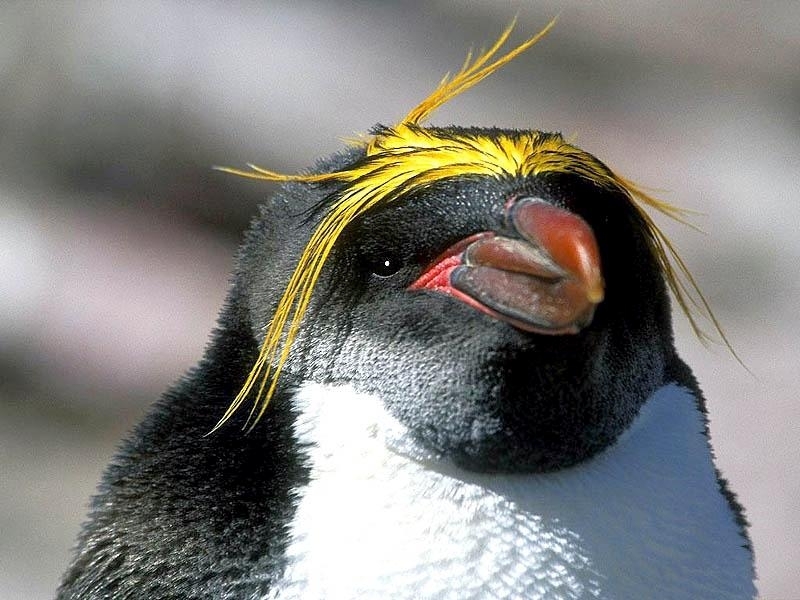 Macaroni Penguins are the most common and abundant penguin species with an estimated global population of about 9,000,000 breeding pairs. 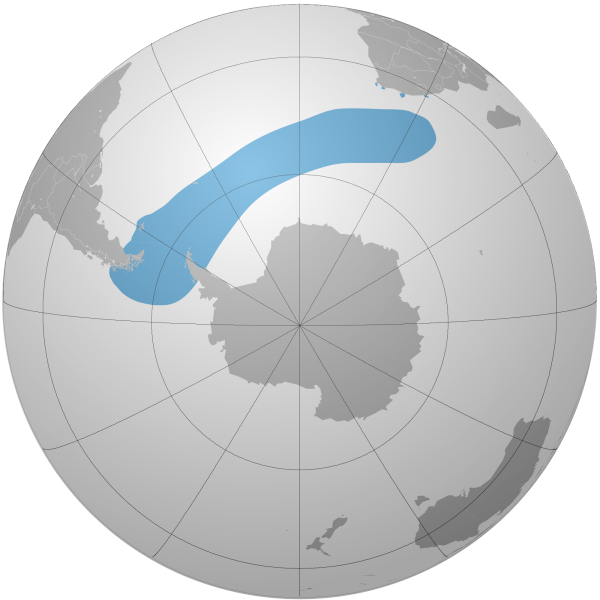 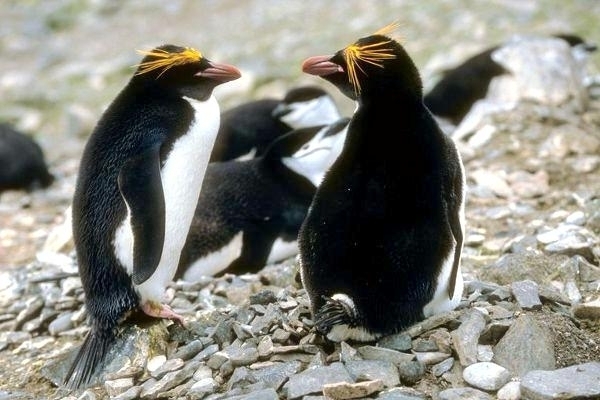 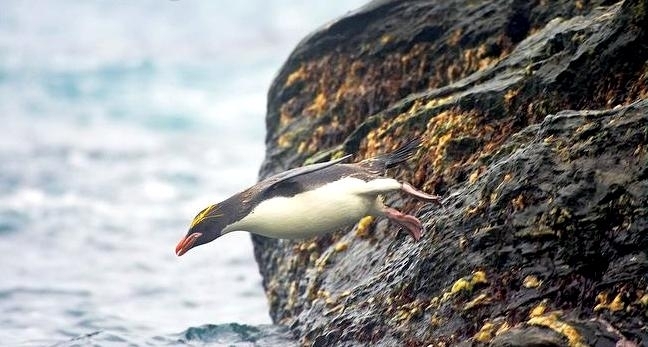 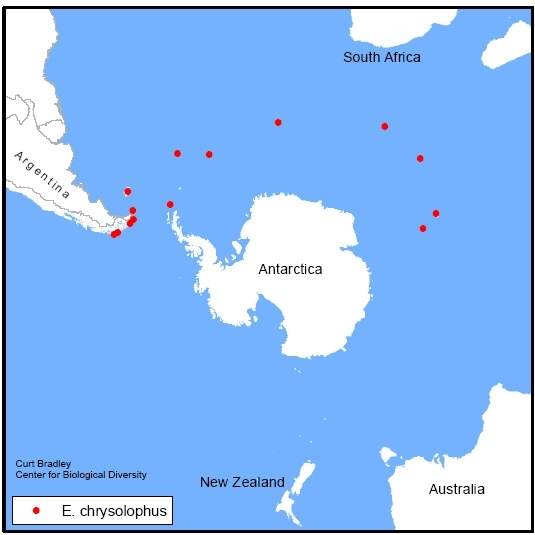 Macaroni Penguins have a circumpolar range and at least 50 known breeding sites are found on sub-Antarctic islands in the South Atlantic and southern Indian Oceans. 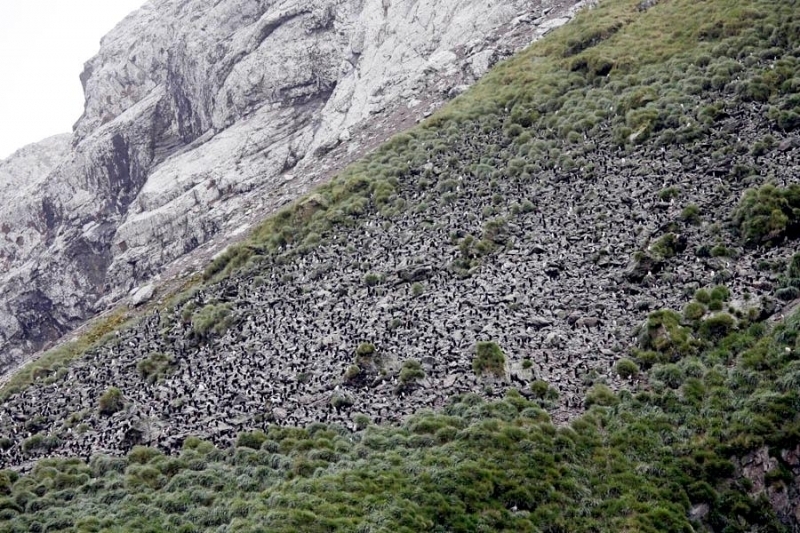 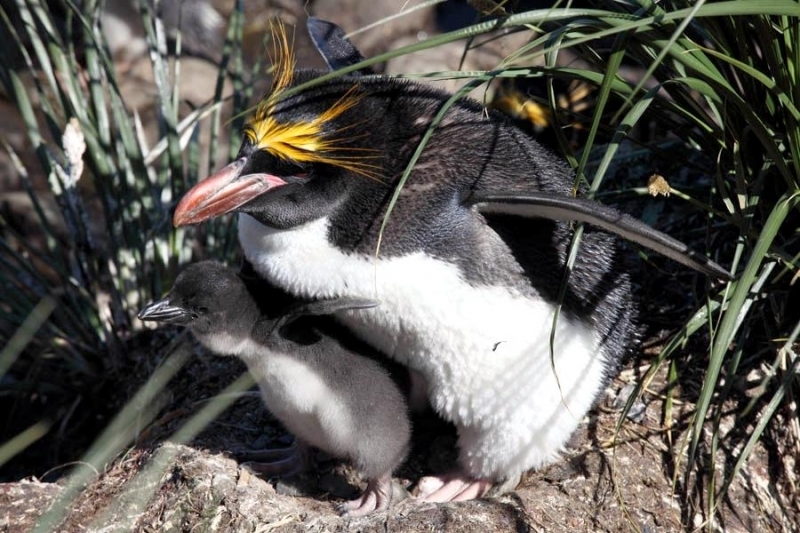 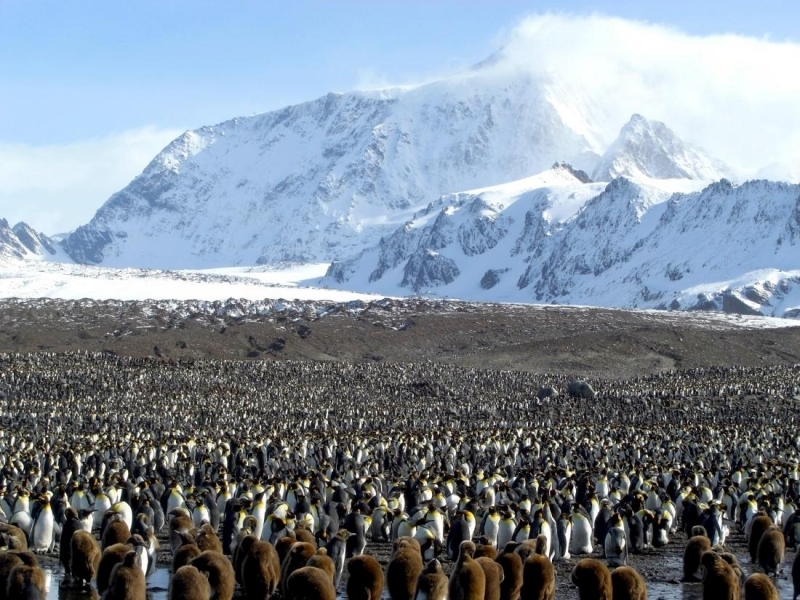 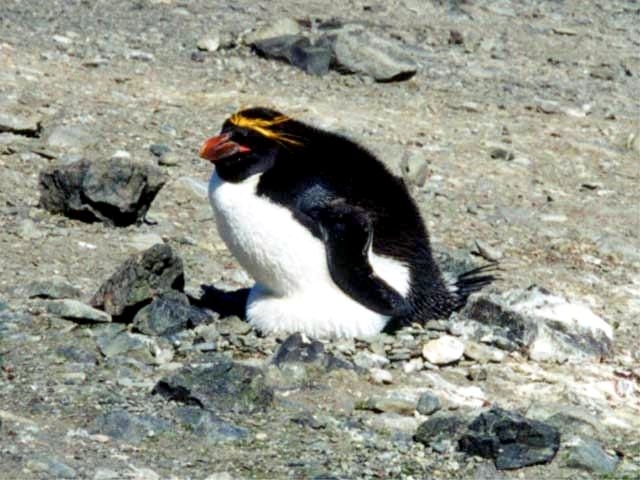 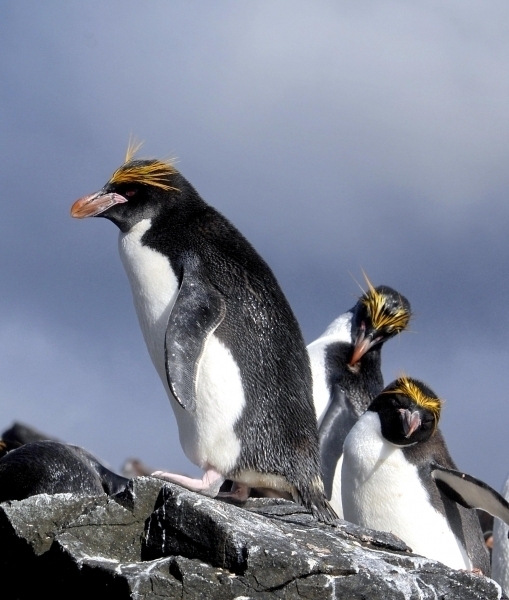 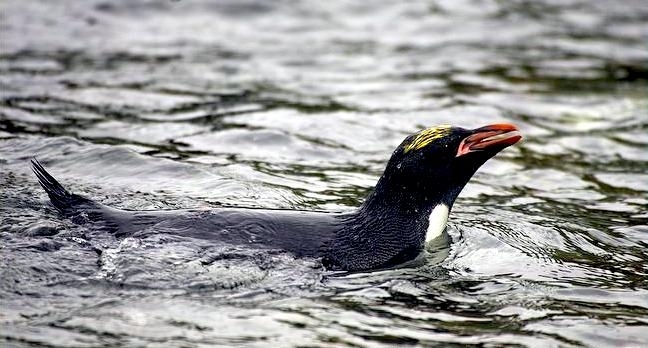 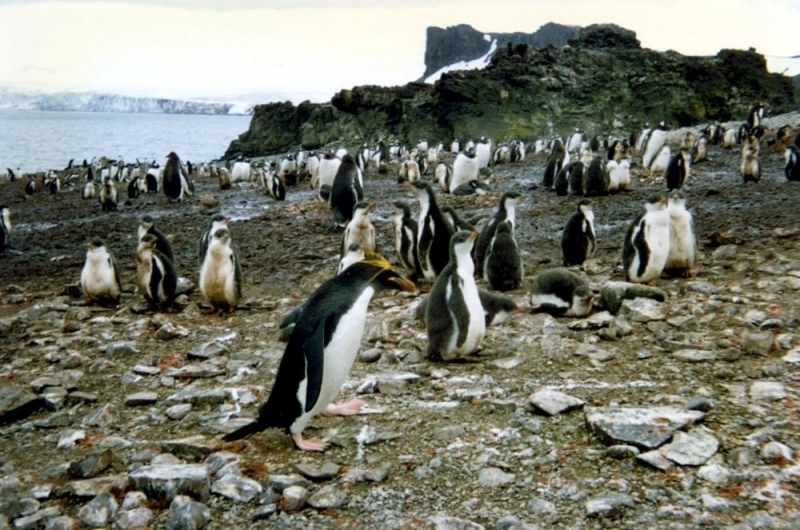 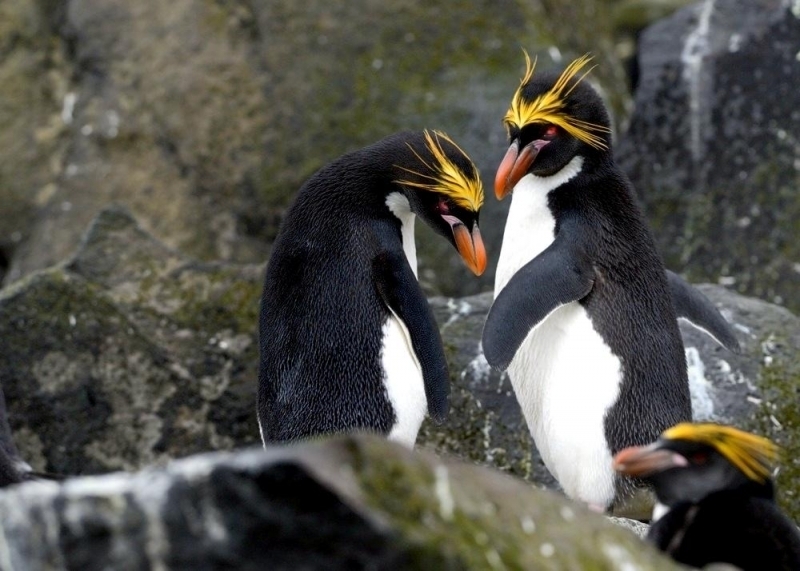 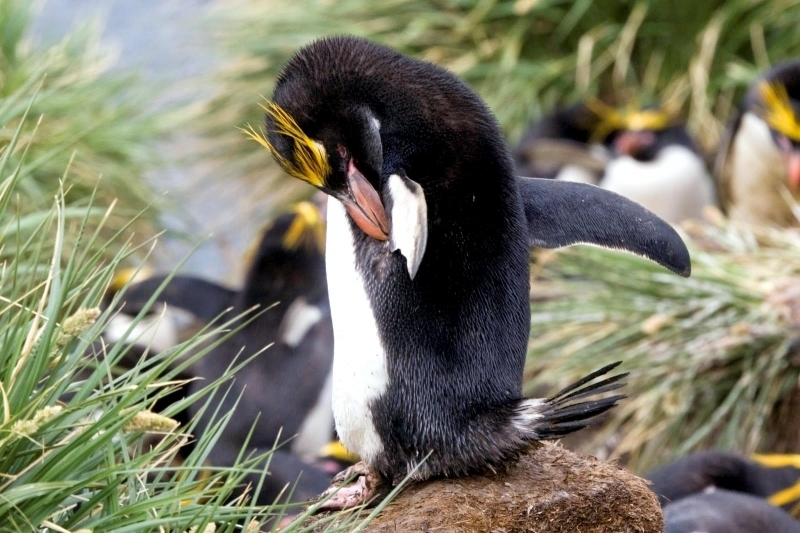 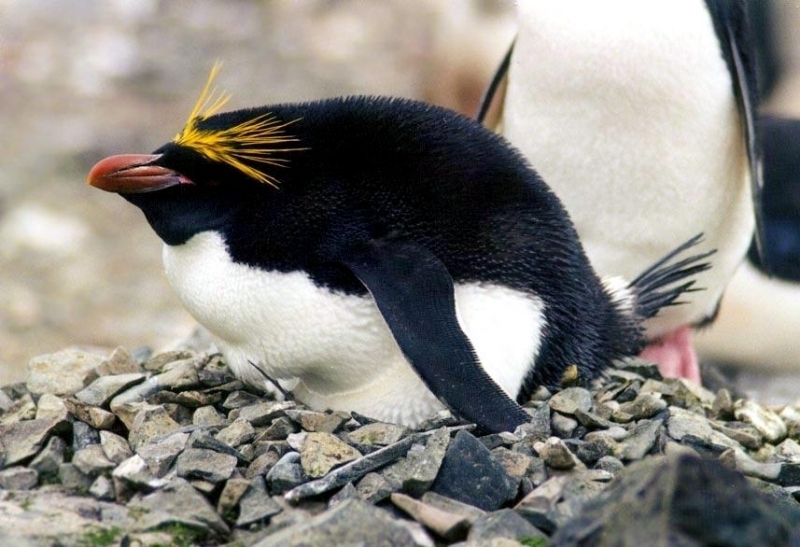 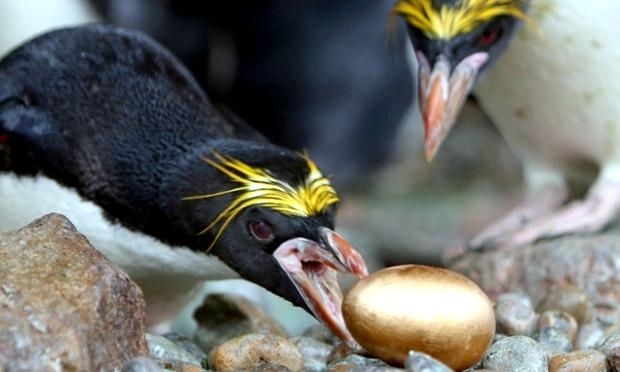 One Macaroni Penguin breeding site has been identified on the Antarctic Peninsula. 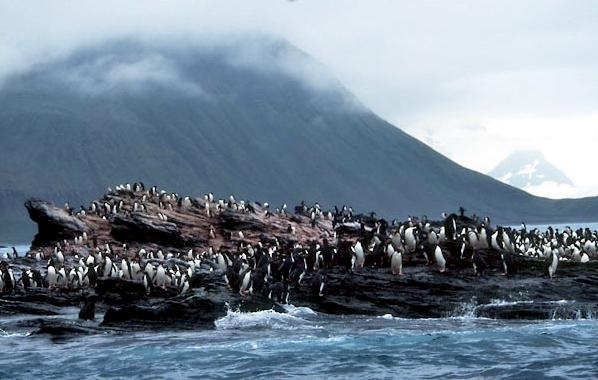 The primary breeding colonies or rookeries, are found on the islands of Crozet, Heard, Keruguelen, McDonald and South Georgia, however the South Georgia populations have decreased dramatically over the past 20 years. 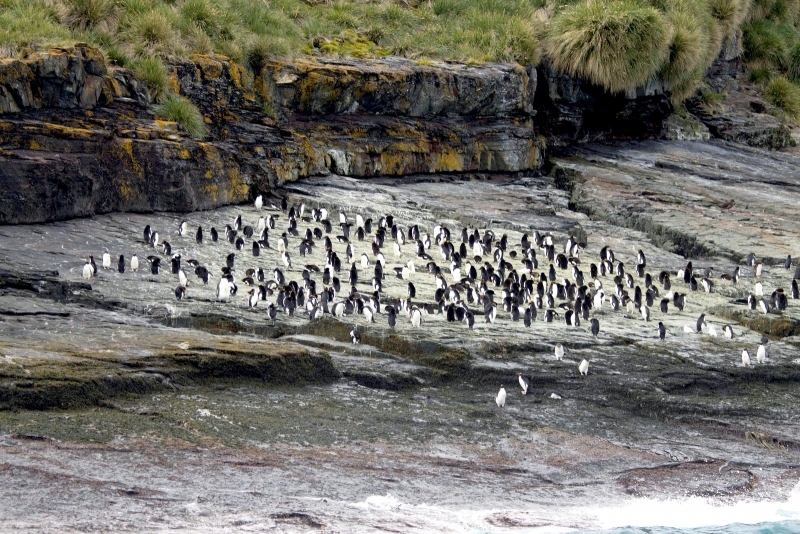 Breeding colonies are commonly found on rocky slopes. 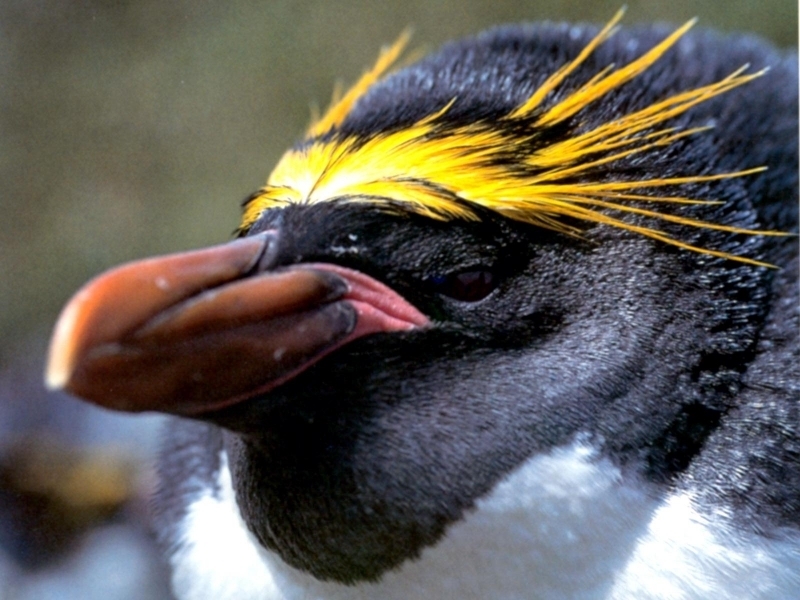 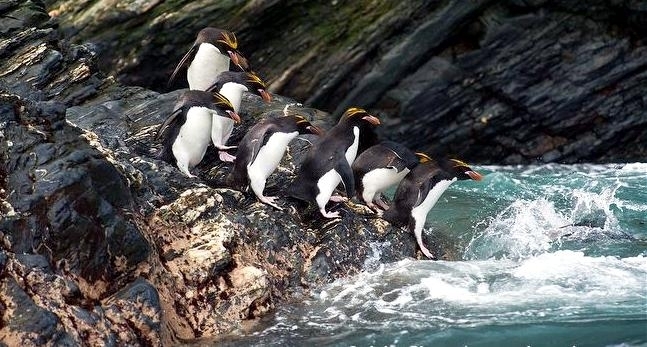 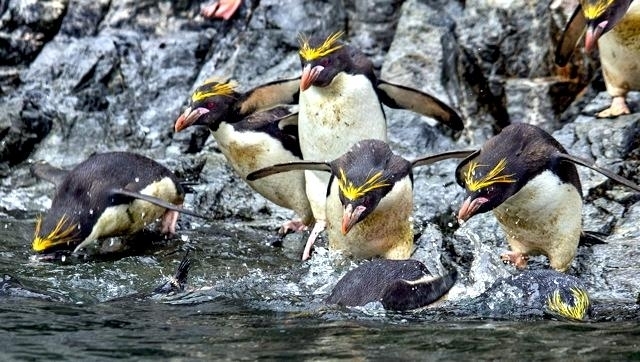 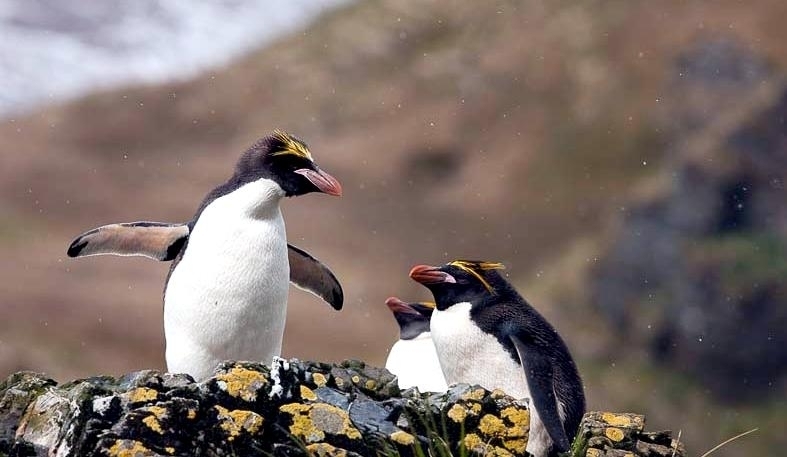 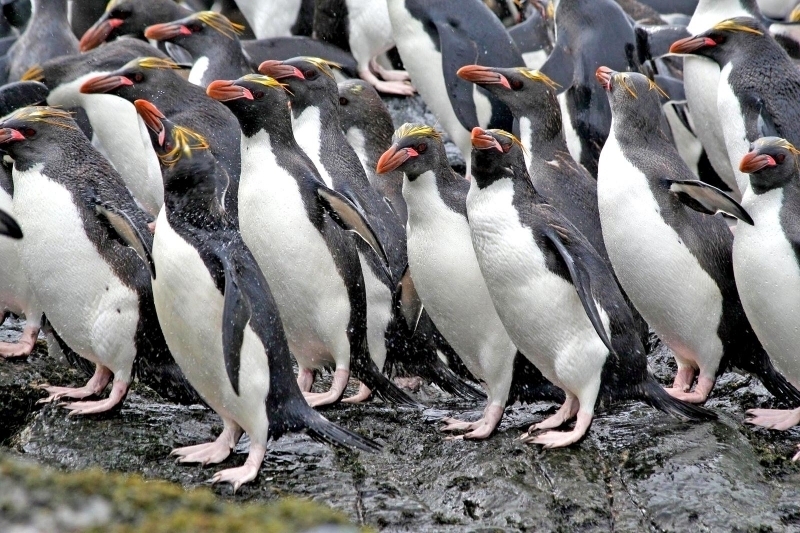 Little is known about the range of this species outside breeding season, however scientists believe Macaroni Penguins remain in the open ocean. 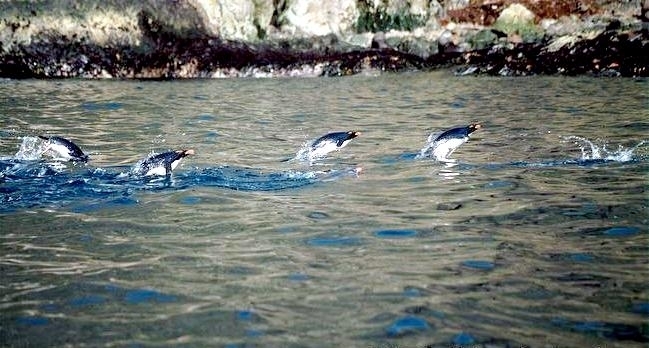 They forage during the day on krill and small fish. 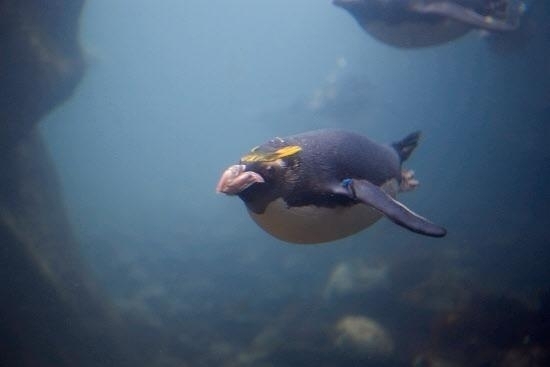 Dives have been recorded at average depths of around 15-70 meters for about 2-3 minutes, although some have been observed diving to 100 meters. 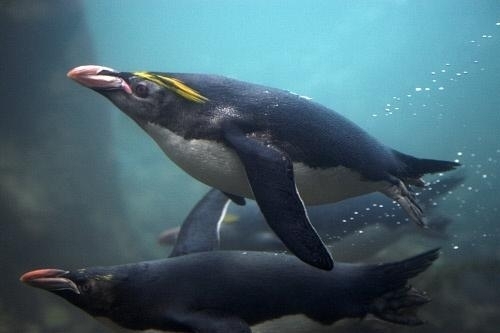 Southern Sea Lions and Killer Whales are known predators of this species at sea and Skuas and other seabirds are known to take eggs and chicks. 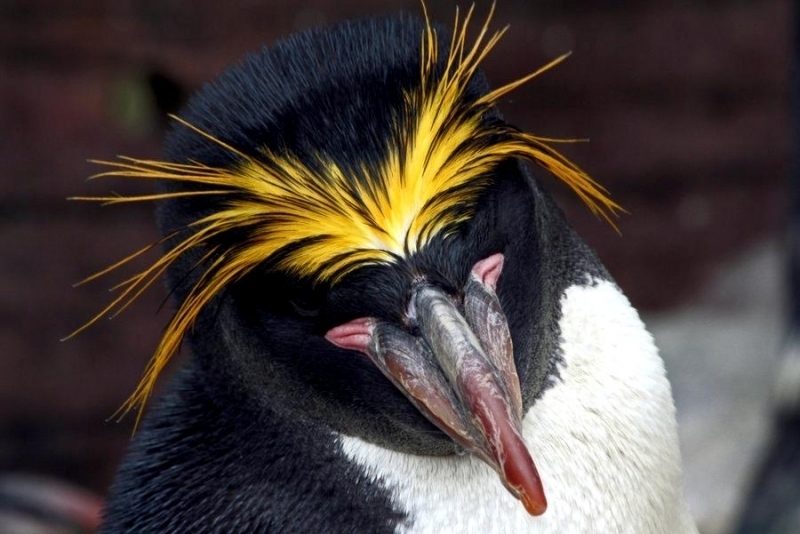 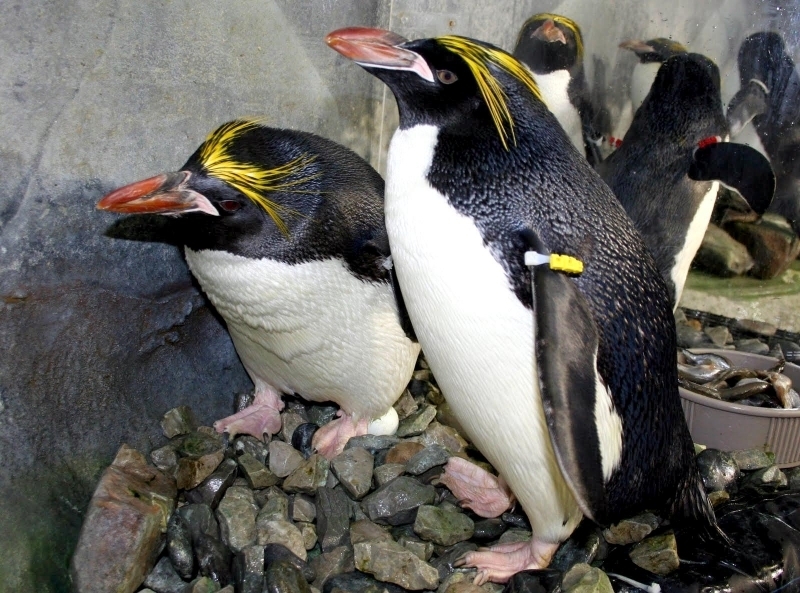 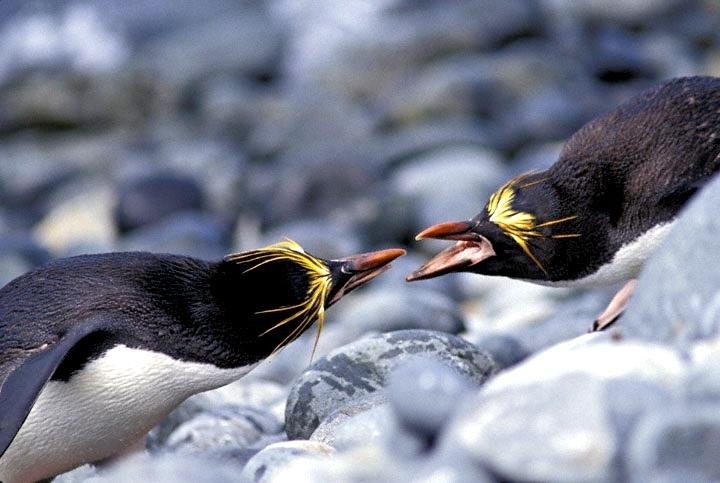 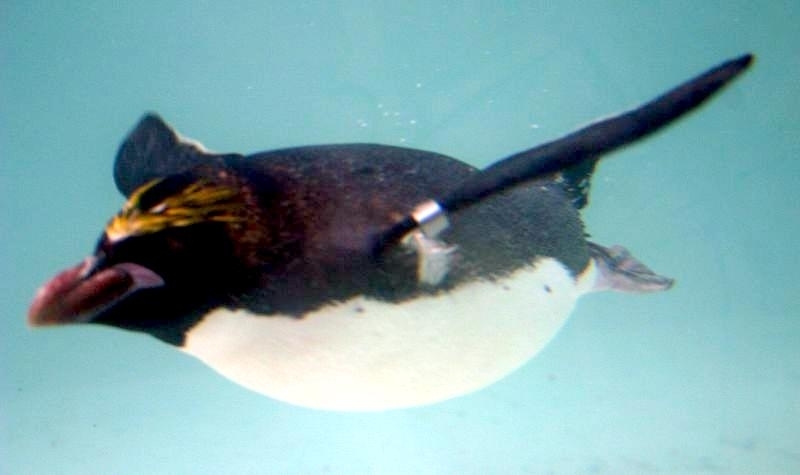 Male Macaroni Penguins reach sexual maturity at 5 years for males and 6 for females. 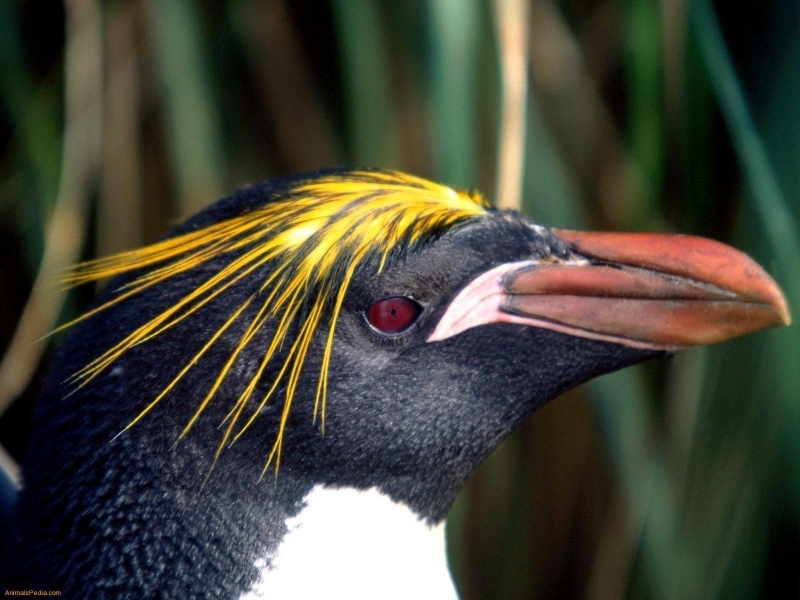 Males return to the breeding colonies each year in October and November, followed by the females a short time later. 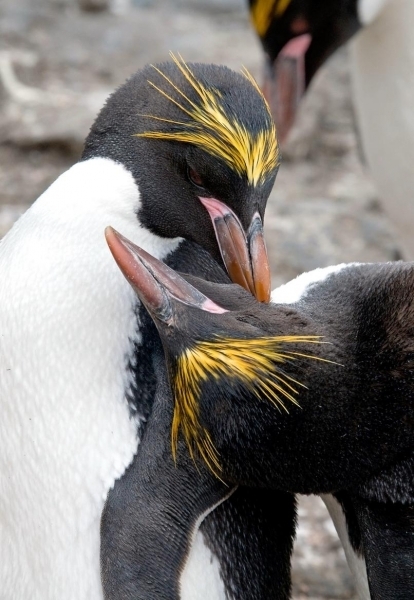 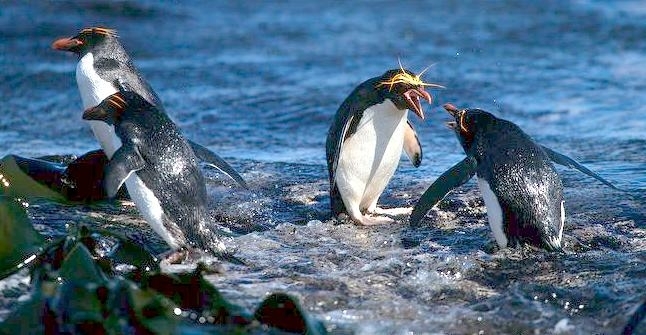 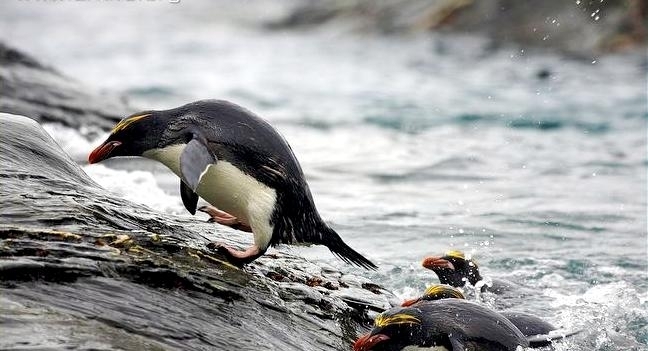 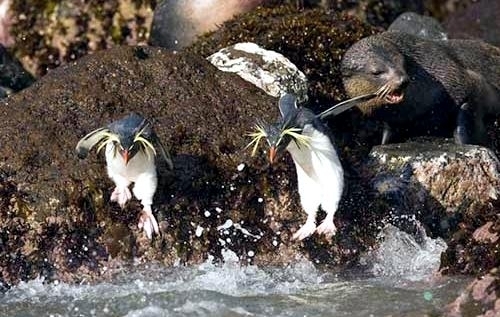 Like other penguin species, Macaronis are monogamous and pairs reunite at their nest location, identifying each other through their distinctive calls. 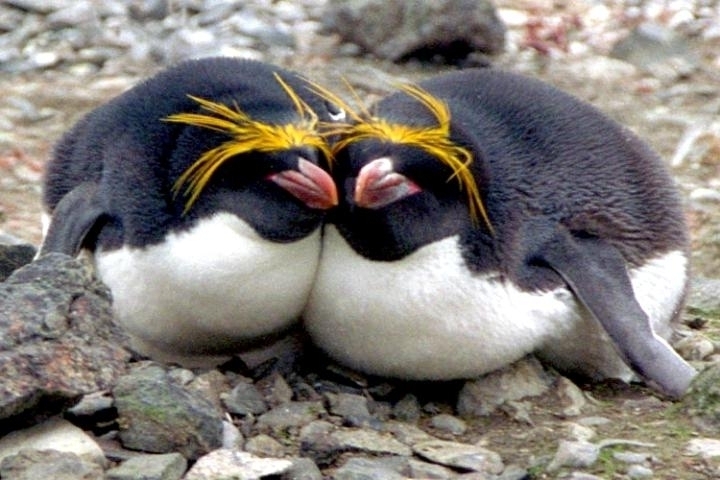 Mating behavior includes the ‘ecstatic display’ where the pairs swing their heads from side to side. 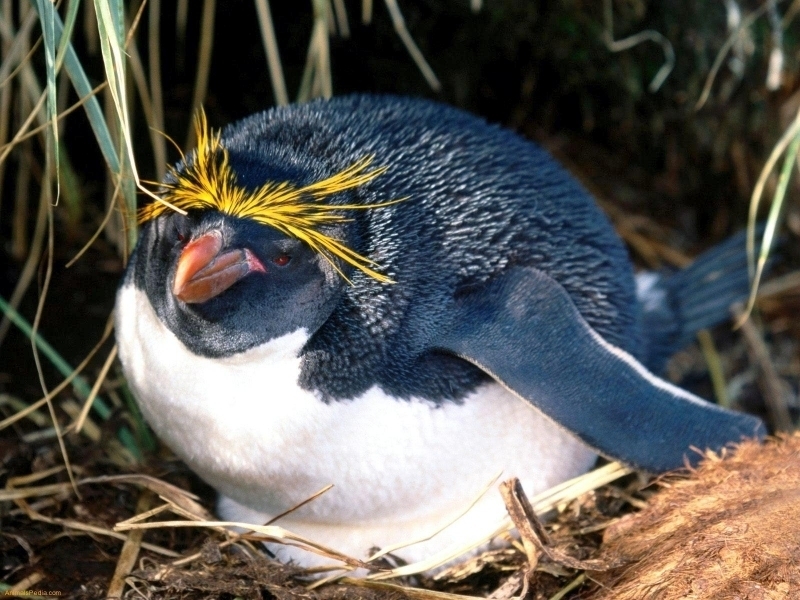 Nests are shallow burrows in the ground lined with grass. 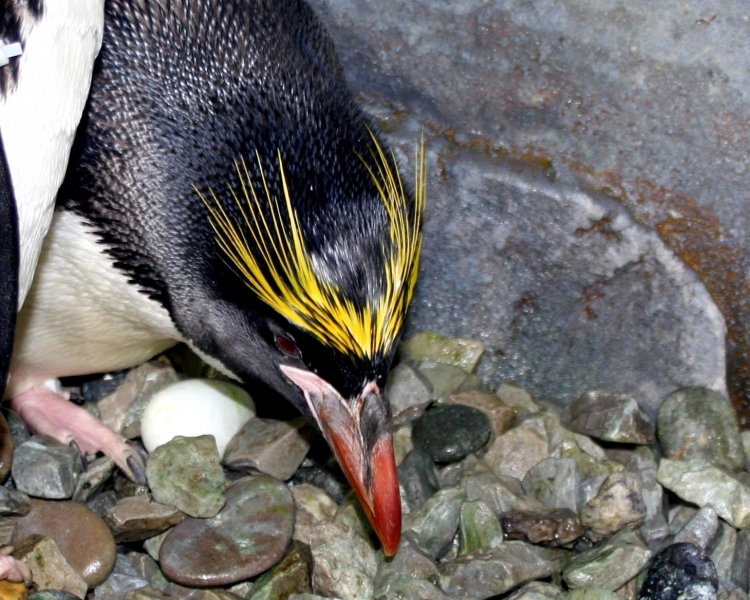 Females lay 2 eggs, the 2nd of which is typically the larger egg chosen for incubation by both parents, which lasts for about 37 days. 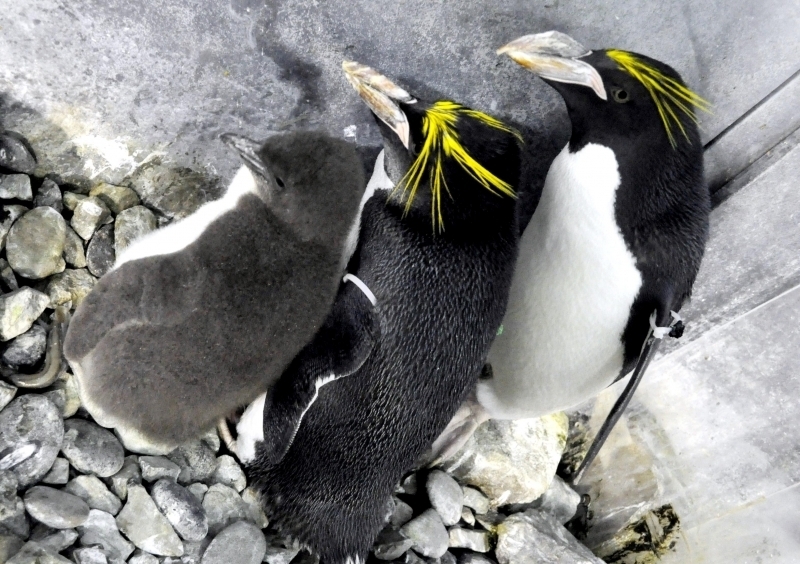 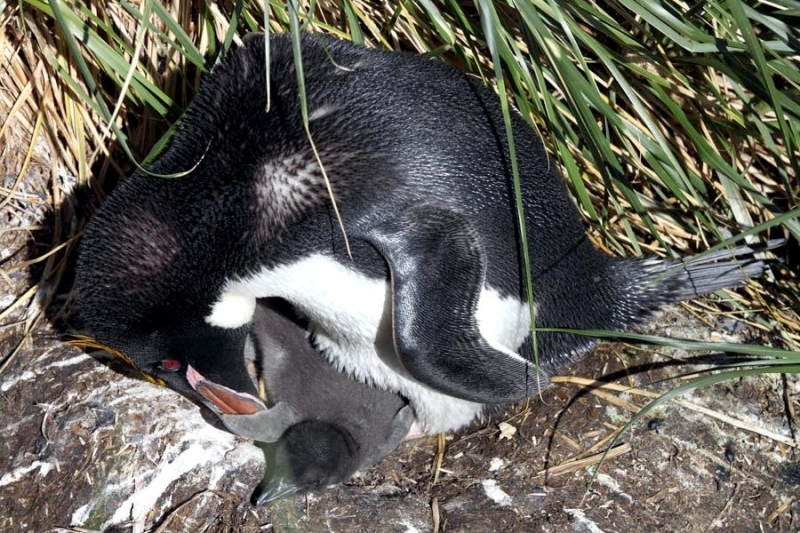 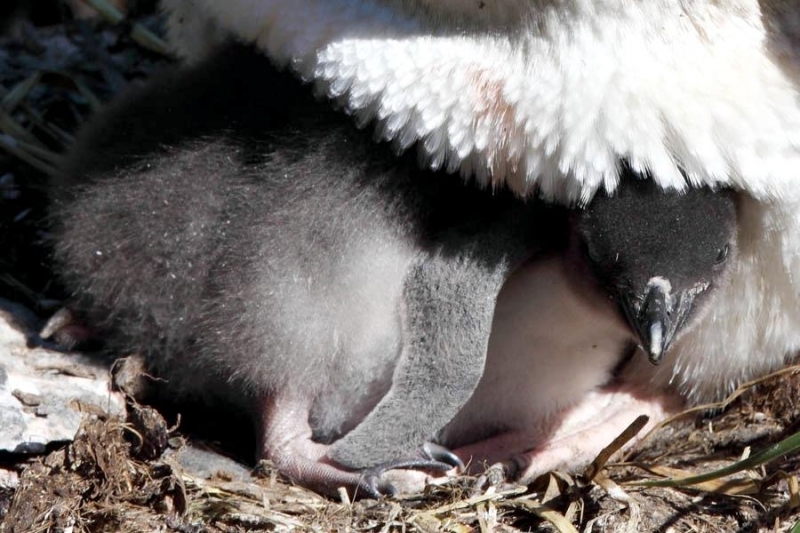 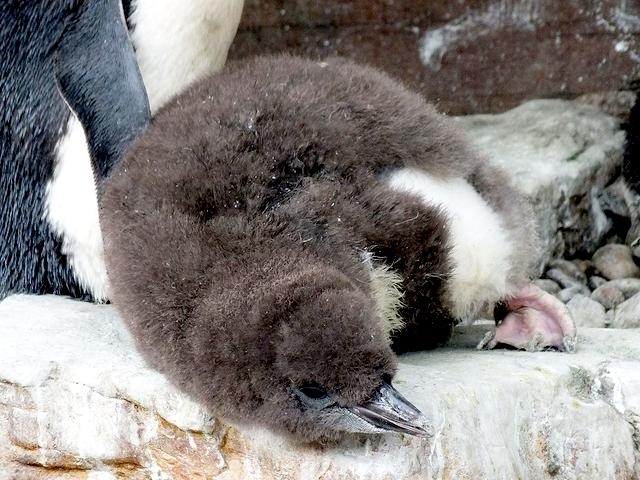 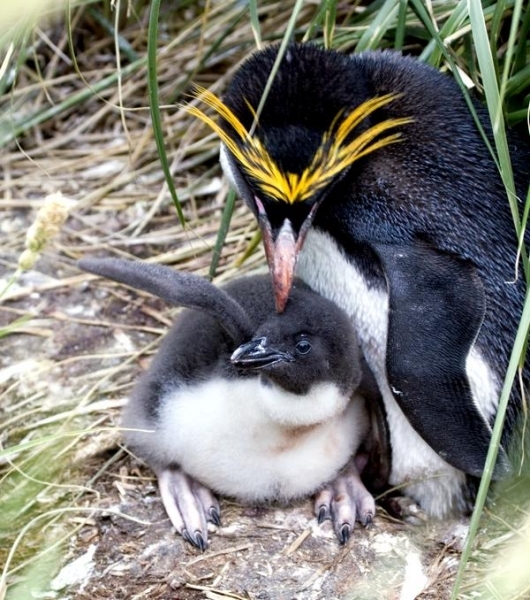 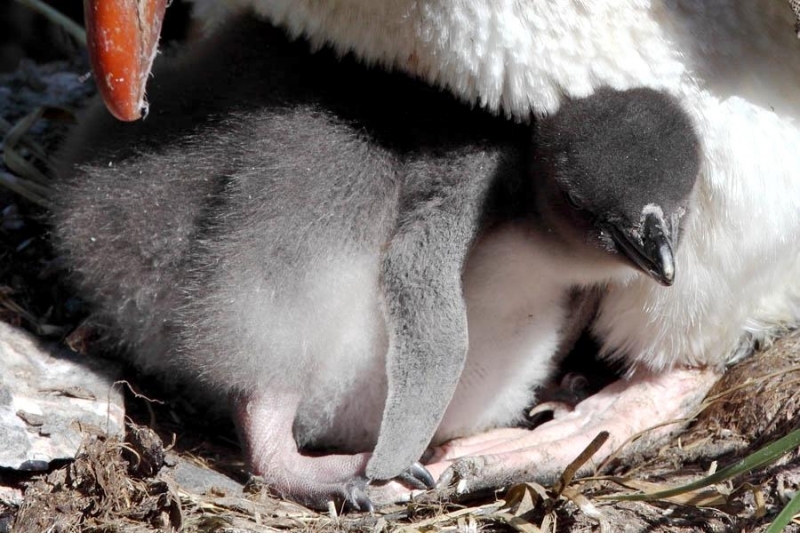 Macaroni Penguins alternate incubation in 3 shifts; the first lasts 8-12 days and is shared by the parents. 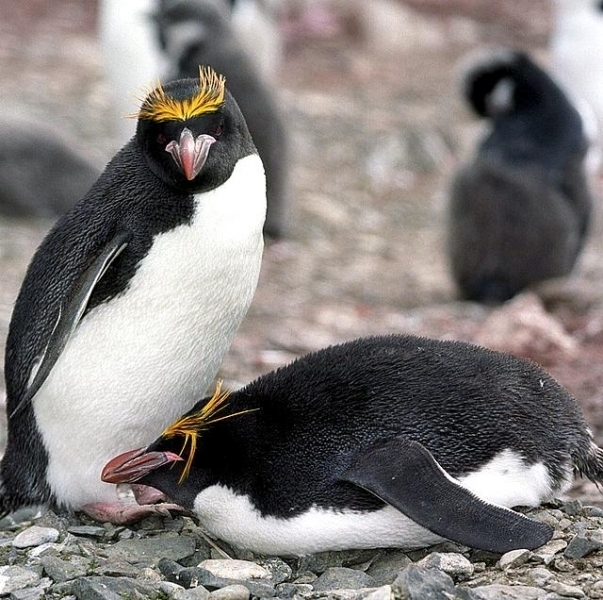 The second lasts about 2 weeks and is taken by the female while the male forages at sea. 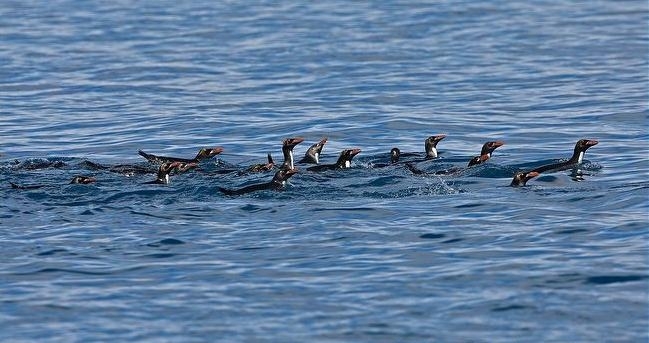 The final shift lasts between 9-11 days and is taken by the male while the female forages at sea. 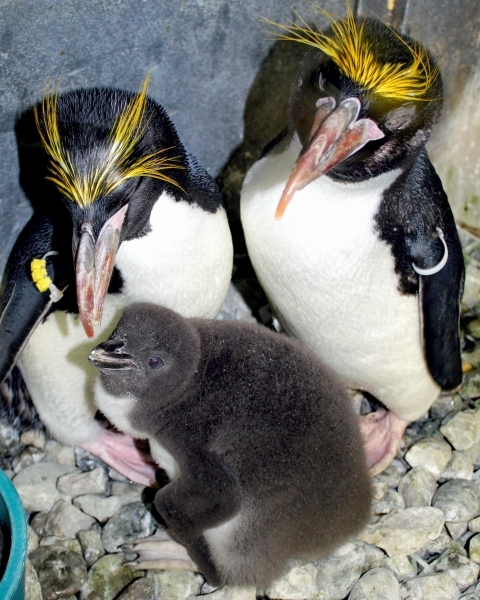 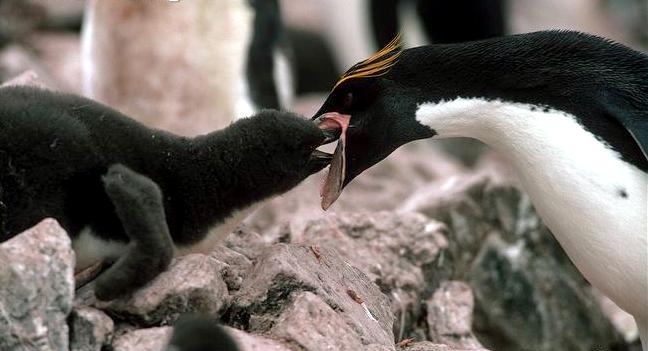 Newly-hatched Macaroni Penguin chicks are brooded by the male for about 3 weeks and the female forages and feeds the chicks daily with regurgitated food. 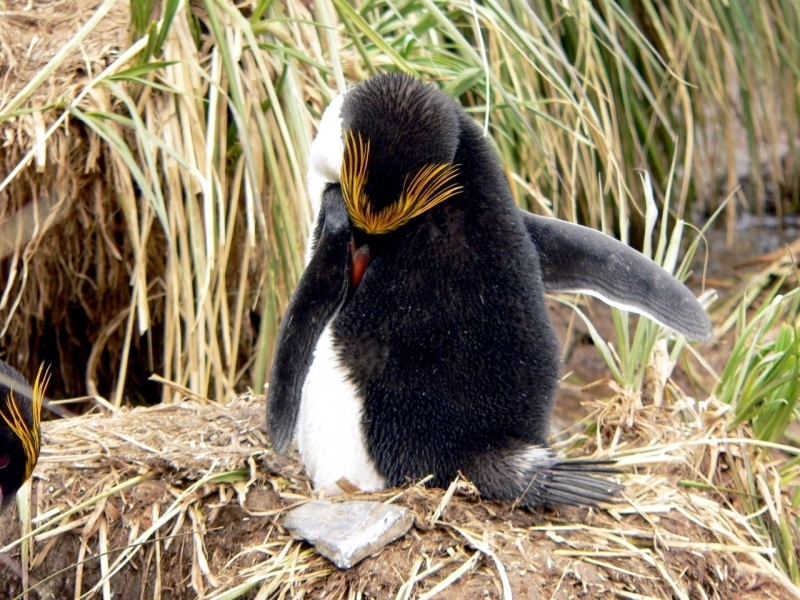 When the chicks develop their adult plumage, they leave the nest and form small crèches (groups of chicks) while both parents forage. 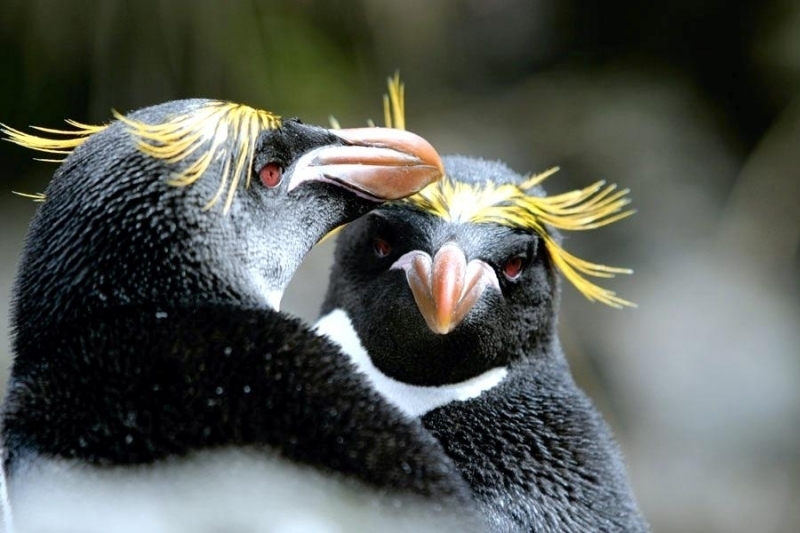 Most chicks fledged at about 2 months of age when they have developed their waterproof plumage.